recommended for: Fans of Tim Burton, obviously. Lovers of scary stories, haunted houses, and things that go bump in the night. 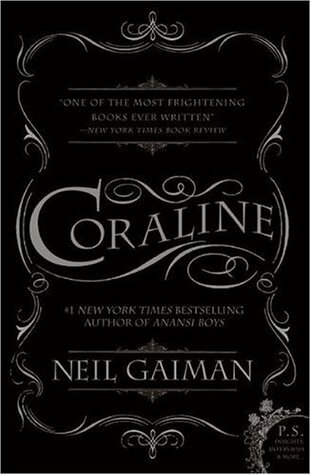 I really wanted to love this book, especially considering how much I love Neil Gaiman and how much I enjoyed the movie. I just didn't. I liked it, I really liked it, but it didn't give me the tingly literary elation of Stardust or Neverwhere or The Graveyard Book. The aesthetic is wonderful, and so is the writing. Pure Gaiman, eerie and like an old timey story. I think the hitch for me was in the plot. It just went so fast. I had expected a slower, more suspenseful introduction to the other mother's evil, but that revelation came right away and most of the book was spent trying to free the captive souls. I would have liked to see a switch in emphasis. That said, it's still classic and the concept is brilliant beyond measure. It starts out perfectly, with a great eerie horror-story set-up. Neglectful parents. Girl goes exploring. Strange things keep happening and suddenly she's in an eerie otherworld that seems in some ways too perfect, in other ways ghastly. Here's where I thought it fell a little flat. I wanted the reveal to be slower. I didn't expect the other mother to reveal her true colors so quickly. It made it feel less horrific to me that we were shown the truth so quickly. So I didn't feel as invested in the end, because it just seemed to take such a long time. I think it just peaked in its horror too quickly. Not to say that it wasn't exciting. I just have higher standards for Gaiman. No complaints here. The concept is brilliant and sadistic and unique in a way that Gaiman is so perfect at. It takes every child's greatest desires and worst nightmares and rolls them into one. Dolls and toys become sinister. Freedom from parental control becomes terrifying. It reminds me very much of old Are You Afraid of the Dark? episodes. Want to come live with us, dear? says the eerie otherworldly parental figure. Seems like a great idea...until she shows her teeth. It's classic in ways, but Gaiman gives it a darkly funny twist. Gaiman's characters tend to be caricatures of reality that somehow seem perfectly real themselves. I don't know how he does it and I envy him for it. Coraline is the stereotypical little girl drawn to such epic proportions that she's totally believable. Very Roald Dahl like, only with bite. No recipes. Day-glo gloves. Always wanting to be treated with more attention, fewer rules. Her parents are exaggerated too--the absentminded adults who send their daughter out into the yard to play. It's this that gives the story a lot of its dark fairy tale quality. But exaggerated as they are, they're still relatable and so real-feeling. You want to root for them. Gaiman's style is one of my favorites in literature. Part fairy tale, part satire, witty and dark and elegant and eerie. His pages are filled with sarcasm and poetry, silliness and the most beautifully vivid descriptions. You feel like you're in a magical place from page one. It manages to feel childishly whimsical and also very adult. Different ages of readers would all love and understand it, but they'd get very different things out of it. Perfect, as always. The addition of pictures makes it feel even more like an old woodcut fairy tale tome. A dark modern fairy tale that waxes both horrific and whimsical.